and we all had a wonderful time! a few minutes walk from Baker Street Tube station (Sherlock Holmes country! ), The Planetarium, and Madame Tussauds famous waxworks museum. Basically, all of London is at your doorstep, and we have arranged the schedule so that there is time to "do it all" - to tour, dance and to attend your favorite workshops. 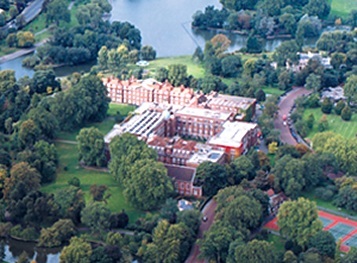 Regents College is located just inside one of Central London's largest Parks. You are in a park, but walk two city blocks and you are in the throbbing heart of a great city. The accommodation consists of student twin rooms with bathrooms and showers down the hall. There are some single rooms and a few triples. There were workshops during the day and contra dancing at night with Wednesday day time free to go touring. We rotated the schedule each day to give everyone a chance to plan their touring around their favorite workshops.